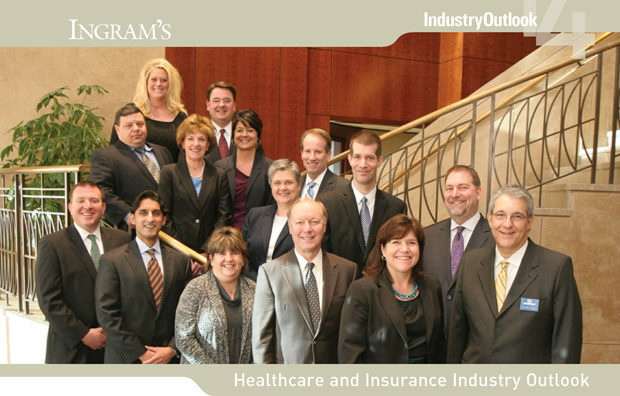 When Ingram’s started its Industry Outlook series 15 years ago, we worried that an annual review of a given industry just might get repetitive. Then Sept. 11 happened, and we were reminded of just how susceptible to change even the most bedrock of industries could be. As we gleaned in our annual Healthcare and Insurance assembly this past month, no industry has been subject to more change more profoundly than health care. We were fortunate to have as guides Rick Kahle, president of the benefits division at Lockton Companies, and Danette Wilson, chief marketing executive at Blue Cross and Blue Shield of Kansas City. Kahle and Wilson ably chaired the assembly, which was sponsored by their organizations. As Rick Kahle explained, Lockton has added significant high-level re-sources on the compliance and analytics side to help its clients make sense of the Affordable Care Act, the source of the industry’s current unease. “We’re trying to help bring as much certainty as we can to a very uncertain environment,” said Kahle. “Affordability is the No. 1 thing we hear from our customers,” said Danette Wilson, “and that pressure continues to mount.” As she explained, customers are demanding affordability, saying that they cannot pay any more, and providers are saying they need more money to handle the ACA and to continue to invest in their businesses. “That’s a very tight rope and a major challenge for us,” Wilson added. Danette Wilson noted that one of the biggest disappointments about the ACA was that it had been developed to help provide health insurance to all people who were without it, “but it really hasn’t put much of a dent into the uninsured at all.” Only about 20 percent of those enrolling in Blue Cross’s individual plans did not have insurance before. Danette Wilson asked her colleagues whether physicians, hospitals and other providers had the ability to take on additional risk from the payers. “Part of the problem,” said physician Eric Justin, chief medical officer and vice-president at Lockton, “is we don’t know the costs very well.” He cited the various studies that showed somewhere between 15 and 35 percent of all imaging was unnecessary. There would be a value to going back to the table with the payer and reviewing the numerous variables that affect cost and outcome. “From a physician perspective,” said Eric Justin, “the frustrating part is just the amount of time that [EMRs] have added to the end of the day.” Although his own background is in IT, Justin could spend two to three hours an evening on documentation. He argued for standardization of workflows on a national scale, not just on a local scale. Kristie Arthur, with Mosaic Life Care in St. Joseph, the new brand for what had been Heartland Health, spoke to the value of the Cerner medical record program that her group has been using to target patients and track their progress. Mosaic has been taking some of the same quality metrics used for years at Heartland and employing them at the clinics. “We’re still in our infancy yet,” she acknowledged. What has impeded the effectiveness of EMR technology across the board is the failure of patients to get with the program. Bruce Bagley objected to where the onus had been placed. “I’m on a campaign to get the term ‘noncompliant patient’ removed from our vocabulary,” said Bagley. “We’ve used that far too long as an excuse for either our inability or unwillingness to engage patients to help them take part of their care.” He saw the need for pro- viders to engage patients and motivate them. “But we still find some patients choosing between health care and food and that’s where our financing piece has to be brought up,” said Kristie Arthur. Eric Justin admitted that it was difficult to pull physician bias out of the patient decision-making process—he called it “the hammer-nail thing”—but he thought it possible and useful to create a decision-making model directly focused on patients. “Consumers are getting more savvy,” said Tierney Grasser. They are getting more involved in their care and more cost-conscious. They are more likely to challenge their doctors. Much depends on plan design, said Jean Hansen. If patients have a “chip in the game,” they are more likely to get involved in the decision-making process. Given the capabilities of the new technology, Kahle asked what kind of information the patients were receiving to make them better informed consumers. “PCMH reads well in the magazine and looks good on paper, but it really takes leading practices,” said Brian Burns. Burns noted that the PCMH program Blue Cross has today is different than the one rolled out in November 2009. “And that is good, because it does get to the continuous improvement.” According to Burns, the program has reached a new level in terms of quality measures and producing the metrics employers want to see. “One of the things that I think is a positive about the PCMH movement is that we’re working in a more collaborative teamwork model with our patients,” said Eric Justin. Wilson asked a theoretical question of what a reimbursement system would look like, if given today’s technologies, the industry could start from scratch. The basic concept of the ACO, Rick Kahle explained, involves moving from a discounted fee-for-service to another form of payment methodology. “The promise of ACO was care coordination, care quality,” confirmed Brian Burns. He noted that the strategy behind ACO reimbursement is to foster and encourage coordination of care. “I do like the competitiveness of it,” said Burns. He said that there are multiple ACOs forming, which he sees as good both for the industry and his own company. “If you can improve quality of care, improve access, and bend the cost curve, you’ve hit the trifecta,” said Burns. Rick Kahle addressed the effect of the ACA on small businesses. As he explained, many of the small businesses bought a year’s delay with early renewals. By the end of the year, however, the effect of community rating should be more obvious. Before Jan. 1, 2014, the difference in the individual price for coverage on a healthy 18-year-old, as compared to an unhealthy 64-year-old, may have been as much as 25– or 30–1. Under the ACA, the community rating structure mandates that that band get narrowed to 3–1. Kahle sees an irony in the drive to enroll young people. “They didn’t want to sign up when insurance cost $50–75–$80 a month, now it’s going to cost $170 or $400, and that young person is saying, “well unless I’m subsidized, thanks, but I’m out.’” Many of them think themselves bulletproof and, even if not, they can always present themselves at the ER and get care. “The ‘transitional relief’ that the administration calls it exacerbates the problem,” said Danette Wilson, “but gets them past he mid-term elections.” Wilson believes that if Kahle’s prediction of a 20 percent defection rate by small groups occurs, it will only aggravate the uninsured crisis even more. As Kahle noted, the incentives are not aligned right now to create the kind of risk pool needed to make this system work. The penalties are not enough to get people to buy insurance, and those who do buy will be subsidizing people at the other end of the spectrum that need coverage. Complicating the issue, as Wilson notes, is that 20 percent of those who have signed up have not paid, despite the hiring of additional staff to help people understand what they are buying and how they are expected to pay. Wilson spoke to the “daunting challenges” that everyone in the industry faced, patients and providers included. “We’re open to collaboration,” said Wilson. “And most important, we want to do the right thing. With that type of perspective, there’s an opportunity for us here in Kansas City to really come together and make a difference for the members that we all serve.